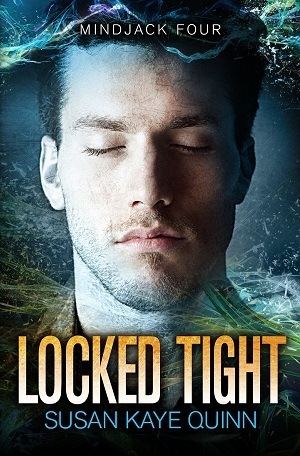 Happy Book Birthday to LOCKED TIGHT! Hi there! Today I’m sharing a release day review for a new dystopian future novel from Susan Kaye Quinn. LOCKED TIGHT is the fourth book in her MindJack series where humans have evolved the ability to broadcast their thoughts–but the new wrinkle is mindreaders who can hijack your brain. These “mindjackers” are a super powerful minority, being hunted for experimentation and extermination. And Zeph, a “locksmith” mindjacker who can lock and unlock the toughest minds, will do whatever it takes to keep himself and his family safe. I’ve reviewed OPEN MINDS, the first book in this series on the blog, and I’ve read all the books/novellas out so far. It’s a fantastic series, and I’m so glad to return to this amazing fictional world. Promo pricing of $.99 on this book through Wed 4/19! In a world filled with mindreaders, being a mindjacker is a good way to end up dead. And Zeph is no ordinary jacker. Zeph left his home and family behind the day the world learned about mindjackers. He’d been recruited to one or another “clan”–a mafia of mindjackers had long existed underground–and he wasn’t proud of the work he’d done for them. But if the world knew mindjackers existed, he was sure being in his home would bring trouble for his mother, father and young sister, Olivia. He fled Chicago New Metro’s suburbs for the more sparsely populated Wisconsin, getting by on his wits and skill as a jacker–and keeping his more powerful abilities as a locksmith locked down tight. Eighteen months later, he’s trying to find out what happened to his family. A check-in showed a home which looked hastily abandoned. Did jackers come and take them? While rescuing a mindreader from the predation of his mindjacking boss’ influence, Zeph abandons his newest post on a mission to find his family. He links up with the mindreading community, taking a position as a bodyguard to the daughter of a prominent mindreader: Jeffrey Tiller. Tiller’s father invented mindware tech–devices that read and interpret mindreaders’ projected brainwaves to operate phones, cars, televisions, etc. Tiller is himself virulently anti-jacker, and makes no apologies for it. His daughter, Juliette, was dating a girl jacker–and he pulled her from school and put her into one where jackers aren’t allowed. Zeph has to hide his jacker abilities, 24/7 to keep up the pretense he’s just a reader, and hopefully Tiller will like him enough to help find his family. He’s a powerful man with lots of connections–and he does promise to assist. In the meantime, Zeph takes out a jacker who assaults the minds of kids at Juliette’s school, he’s hailed a hero and this lands him in the spotlight he hates–he’s intercepted by operatives in a confidential government agency who are “hosting” his 13 y/o sister as she trains her newly developed jacker powers. Zeph is ecstatic to find Olivia alive, but horrified that she’s unwittingly being honed into a weapon. His primary objective is to get her free, even if it’s against her own wishes. Zeph’s life becomes even more of a shell game as he takes a new mission to get close to Julian Navarro, new senator from Illinois who is a known mindjacker–one fighting for equal rights for jackers, and peace between readers and jackers. People who’ve read the series know that Julian is a good and honest man, and partners with the heroine of the first three books: Kira Moore, herself an intensely powerful jacker. Supposedly, Julian may be dosing readers with drugs to spur changes into jackers–but even if Zeph doesn’t buy that line of hooey, saving Olivia depends on getting close to Julian. And, that’s where Zeph’s whole life gets turned inside out. Expect bombings, shooting, and general destruction to dog his steps as Zeph witnesses the hate for jackers up-close and extremely personal. What few allies he makes are seemingly wiped out before his eyes, and he has to make unthinkable choices to protect Olivia from the danger she’s been programmed to create. I’m not going to say more about the plot: it’s intricate and articulate. Zeph is a good guy caught in every bad situation due to his jacking abilities. He’s not dreamed of having a normal life since he underwent his change at 13 and gained his mindjacking ability–but now he’d give anything for “normal” and he sees how it could be possible if only the bigots would stop hunting the jackers. There’s lots of tragedy in the story, with several casualties, and unexpected allies. At it’s heart, the MindJack series has always been about equal rights, and the fight to gain them for all humans–readers and jackers alike. Zeph has seen enough jackers to know how evil they can be, but the depth of hate coming from readers has always been outside of his experience. Now he knows how horrible they can be, and he’s dead set on finding his parents before they can be destroy–as Olivia very nearly was. I’m down a little because I feel like I lost a good friend on these pages, but I’m excited to read on. Interested? You can find LOCKED TIGHT on Goodreads, Amazon, GooglePlay and iTunes. It’s on special release week pricing of $.99 through 4/19. You can also read the prequel novella THE LOCKSMITH free on Amazon.